ZeroFootprint holds an annual competition for renovated buildings that showcase the most successful, holistic retrofitting projects of the year. This year’s eco retrofit winner was just announced and it’s a historic, previously defunct building in down town San Francisco. 355 Eleventh, retrofitted by Aidlin Darling Design, now has a completely new perforated zinc exterior, increased energy efficiency, more natural daylight, and even a LEED Gold certificate to tack on its walls. 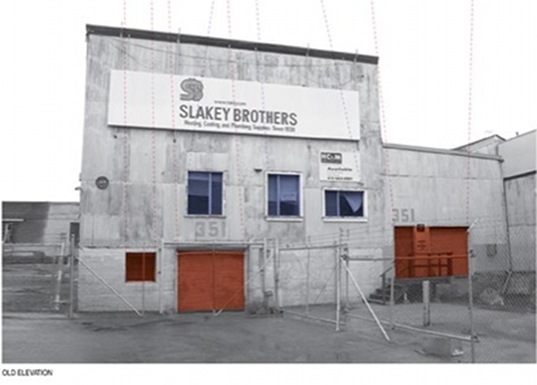 355 Eleventh was a previously derelict turn-of-the-century industrial building, which originally did have a metal skin. The retrofit included refurbishing the exterior and replacing it with a new corrugated and perforated zinc skin. 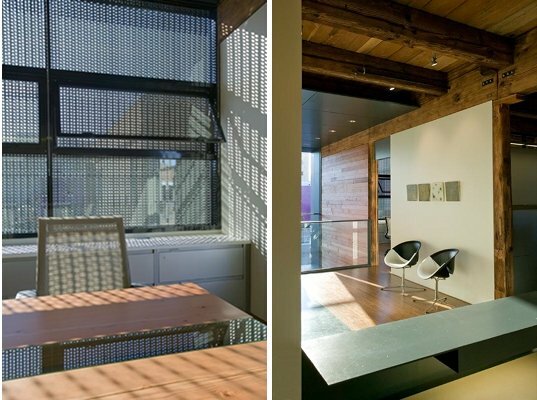 This skin acts as a shade wall, letting air and light pass through and behind, decreasing the heat gain on the building. More natural daylight is let into the interior, but not enough for blinds to be needed. New operable windows allow for cross ventilation through out the building. Inside, the renovated office building is light and airy, and utilizes reclaimed wood for the beams and ceilings. A 30kW solar array covers the upper roof area and harvests approximately 70% of the building’s annual electricity use. The lower ‘living’ roof is designed to reduce heat-island effect, slow storm water run-off and provide enhanced insulation. Enough upgrades were made that the building achieved a LEED Gold certification. The building currently acts as the office of San Francisco’s Matarozzi Pelsinger Builders. Painting the outside is a brilliant idea. It should be done. It would lift the energy. Just looking a t a lot of dull sterile minimalist buildings is very depressing...note when one is where there is color and charm people feel peppy and it draws custom. I like the contrast of simple outside with the inside having more detail and finishes and to me it does not look like an office building. ...and why would you want a warehouse to look like a warehouse just because it's a warehouse- shouldn't we invest money at zero return just to make it look like something it's not? Why miss another chance to deny that we have industry and commerce in our midst, driving our economy? Why succumb to that old form-follows-function trope? You guys have a really bad habit of excessively fawning over the smallest thing. In this case, the building here is aesthetically appealing on the inside (if you're into minimalism) and the architects deserve kudos for getting this one up to a LEED gold certification (probably no easy task with such an old building) BUT this building is not stunning. Look at the exterior; it looks like a warehouse. Seriously, it looks like a warehouse. This is the general style of building in this country which is synonymous with urban blight and decay. It's form speaks of millions of corrugated steel sheds across the country built and maintained form no other purpose than storage. I feel that this architectural firm needs to heavily re-think what they're doing here, and consider a way to make the building more appealing to the eye. My quick and dirty solution? Invite some artists to paint something incredibly huge on the plain facade offered here. It'd at least add visual flair and draw attention away from the unappealing hulking mass of the building and focus it instead on the art on the exterior. ZeroFootprint holds an annual competition for renovated buildings that showcase the most successful, holistic retrofitting projects of the year. This year's eco retrofit winner was just announced and it's a historic, previously defunct building in down town San Francisco. 355 Eleventh, retrofitted by Aidlin Darling Design, now has a completely new perforated zinc exterior, increased energy efficiency, more natural daylight, and even a LEED Gold certificate to tack on its walls.